Apart from the self-explaining voice commands, there are some very important additional functions in TrueCombat. You can apply these functions by using the dedicated Q3TC controls menu which can be found in the main TrueCombat menu. These additional functions are essential in order to gain the best gaming experience. Reload Weapon (reload) - Each weapon uses clips that can hold a limited amount of bullets. If you run out of bullets, you need to stick in a new clip. All unused bullets in the old clip are lost! Zoom In / Out (zoomin / zoomout) - Some weapons have a scope (SR-8, M76) which can be used with the zoom function. Using the zoom function will let you increase or decrease the magnification. Fire Mode - Some weapons have a selection of different fire modes, for example the G36 has full, semi automatic and burst fire modes. The semi-auto mode reduces the spread due to less recoil. The burst mode will fire 3 bullets in a row, conserving your ammo with short controled bursts. Use (doors etc.) - Use is the command to open or close doors. Just walk in front of the door and press the Use button to open the door. If the door is already open, "using" it will close it again. NOTE: To stay silent and undiscovered, you can also open and close doors silently by pressing the walk button while "using" the door. Picking Up Items - In order to pick up items (weapons/ammo) you will need to walk over to the item and "crouch". NOTE: The Drop Weapon command can come into play here also. It is possible to drop your weapon (making space within your equipment) and replace it with the newly picked up item. Bandaging - If you are bleeding use this command to stop losing blood, and finally dying. Bandaging does not regenerate health but will stop you from bleeding to death. Voice Commands - There are variuos Voice commands (V-Coms) featured in TrueCombat. These will help you to communicate with other players, team mates or enemies. If someone talks to you only, you will hear the message and also see an image with the name of the talker. To talk to someone, just look at him while sending the voice command. Equipment Selection - We will go into more detail regaurding Equipment Selection in the following part of the manual. Tactical Mode - Tactical Mode simulates the ability to focus on a target, your weapon is raised for greater stability reducing the spread and recoil of the weapon. You will move slower in Tactical Mode but the increased stability, focus and overall accuracy is your advantage. NOTE: You can not jump or sprint in Tactacal Mode, doing this will kick you out of Tactical Mode. Holster - This will holster your weapon, so that you can climb up ladders or use the cool Freeclimb Feature. 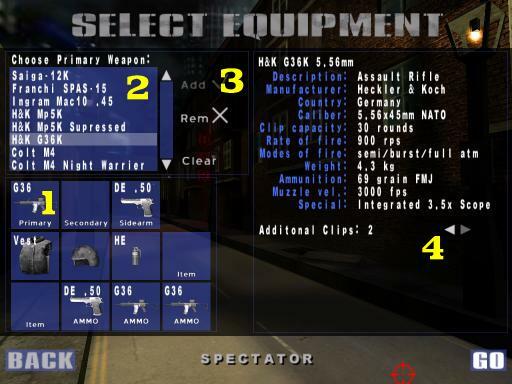 Every time you enter a game in True Combat, you will first see the Equipment Menu where you choose your equipment. As you can see in the image below, you have 3 weapon slots and 8 item slots, but you will rarely use all of them. To choose a piece of equipment, first click on the slot you want to fill (1), then choose from the list (2), click Add (3) and if appropriate, choose the number of additional clips you want to buy (4). Every weapon comes loaded with one clip. Additional clips will each fill one item slot. Note that not all items and weapons will always be available. For example, once you have selected a primary weapon, your choice of secondary weapons will be limited. There is a description of all items to the right. To remove a single item from your inventory, click on the slot it is in and click the Rem button, which is just beneath the Add button. Clear will remove everything so you can start over with an empty inventory. Once you are happy with your selection, click GO to enter the game. Remember that the more equipment you carry, the slower you move and the more quickly you will tire. It can often be to your advantage to leave slots empty intentionally, so as to minimize the weight you carry. Do not forget to pack additional ammo for your weapons. Experiment. After a while, you will find a number of good loadouts, but don't be afraid to try something new. Sometimes, "crazy" equipment choices can be very rewarding, especially if they surprise the enemy. The completely new TC HUD (heads up display) shows the player all information he/she needs to play True Combat. The stamnia indicator ... the more red, the lower your stamnia, the more grey, the better your stamnia ! If you are in the "Tactical View" this will be displayed in the mid-bottom, aswell as when you holstered your weapon. Your movement directly depends on your speed factor and the direction you want to go. running - normal running, depends on stamnia, health and weight. normal noise! walking - normal walking speed. You wont get out of breath while walking. Less noise than running. NOTE: The silent boots help you to move silently, even while walking or running. One of the heaviest Features in TC 0.45 is the Freeclimbing, you can climb up almost everything that you can reach with your hands. To use Freeclimb you have to Holster your weapon... look for an Object to climb up and do it ;) ... for training I would suggest the wood fences in q3tc_baugebiet ! Stepping left or right and backpedaling is slower than going forward. As stated before, the speed factor determines your maximum speed while running and depends on your carried weight and your health status. If the speed factor equals 100, you will run with double walking speed. If the speed factor equals 0, you will run as fast as you will walk. If your legs damage exceeds a certain level, you will start limping. This makes you extremely slow, even while running. Vertical movement depends on the weight you currently carry. The more weapons or ammunition you take with you, the more damage you will take when falling from greater heights. Your jumping height will also be reduced. You can't jump all the time, as this is too much an effort, so your stamnia will decrease until you can´t jump anymore. NOTE: Jumping from great heights (for example roof tops) is a definite way to suicide, even without weapons.